Rating: ★★★★☆ Rich and Complex. Rewards Close Study. Like other stories in Robert Reed’s Great Ship universe, “The Speed of Belief” stands alone. There’s no need to read any of the others first. 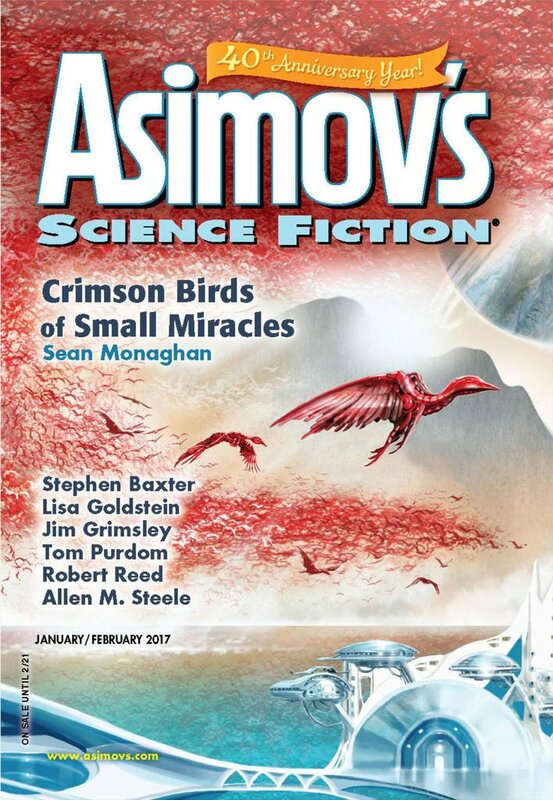 "The Speed of Belief," by Robert Reed [bio] (edited by Sheila Williams), appeared in Asimov's Science Fiction issue 01-02|17, published on December 15, 2016 by Penny Publications. Pro: Rococo and Mere have a simple goal: reach the streakship and escape the planet. Amund has the less-respectable goal of sleeping with Mere, but he also wants to somehow show the immortals that an ordinary human can accomplish something worthy of note. The rivers want to keep the machine intelligences as far away as possible. Ultimately, everyone gets what he/she/it wanted. The call for a human sacrifice is hard to believe, but, as it turns out, that really means the rivers wanted a real human who can actually die—someone who would stay behind and live the rest of his life there. The rivers only want to deal with Amund—they want the other two gone as soon as possible—and toward that end, they’re willing to deal with him and give humanity a better deal than previously offered. At first, it seemed unrealistic that Amund didn’t want to make the decades-long journey in cold sleep. However, given that he thought he’d most likely die shortly after waking up, it makes much better sense that he put off doing it. In the end, all the little details come together, and the story makes good sense as a whole. For those who care about such things, the names are amusing. “Rococo” was an 18th-century style that valued ostentatious, useless ornamentation. “Mère » is French for mother, and Amund means “respectful protector” in Old Norse. Con: Amund’s obsession with Mere and his demand that she sleep with him is very creepy. The text tries to soften this various ways, but we cannot see Amund as a hero in any way. This destroys any enjoyment we might have got from his victory at the end. It’s very strange that Rococo and Mere both claim they don’t know Amund very well, even though they’ve just spend decades cooped up with him in a spaceship. This may reward close study, but I really didn't care about the characters enough to get into it closely. The fact that both men were obsessed with sleeping with Mere and that she was described as tiny with big eyes (in other words, childlike) really, really detracted from the story for me. I didn't notice the childlike bit, but the rest definitely bothered me too. Most stories have things that break suspension of disbelief here and there; it's always a challenge to decide when something is sufficiently bad (and persistent) that it spoils the story.